Silver Dollar City’s Bluegrass and BBQ festival has arrived again and for the Petersen family this is the most wonderful time of the year! Bluegrass enthusiasts, including many family bands, from all over the country and even the world will be traveling to Branson, MO to participate and listen to their favorite music and musicians. In the bluegrass community, the month of May in Branson becomes a big family reunion. One of the highlights of the festival will be the 17th annual KSMU Youth in Bluegrass Band Contest on May 26 held in the Opera House at Silver Dollar City. Young bluegrass players, under the age of 21, accompanied by family members will compete as bands in two rounds for separate panels of judges. The contest is much more than a competition for the participants. It is a time of networking, building lifelong friendships, learning and encouragement for everyone involved. Frequently, the participants gather the evening before the contest to perform their songs for each other to offer constructive criticism and encouragement to their fellow musicians. On contest day, the bands cheer each other on both backstage and from the audience. The Petersen family thoroughly enjoyed playing in the KSMU contest for several years and had two second place finishes. Even though their contest days have ended, the friendships have endured and grown over the years and they now enjoy going and cheering on the next generation of bluegrass kids. The community of bluegrass musicians and fans is what initially attracted the Petersens to bluegrass music. In 2004, the Petersens were vacationing in Gettysburg, Pennsylvania and attended their first bluegrass festival. 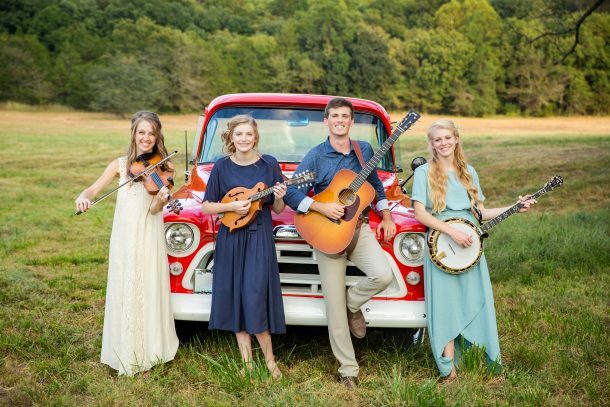 After meeting several of the musicians and family bands at the festival, the Petersens fell in love with the bluegrass family and began their own bluegrass journey. Fourteen years later the Petersens perform full-time as a bluegrass band with their own show in Branson, MO. The Petersens perform three days a week at the Little Opry Theatre located inside the Branson IMAX Entertainment Complex and perform in special engagements in other venues by request. 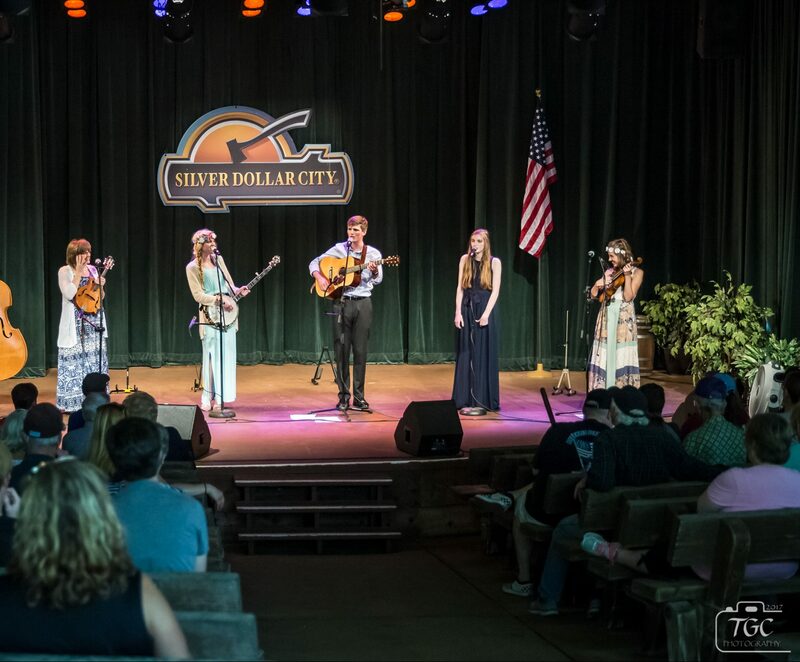 The Petersens are very grateful to Silver Dollar City, the Herschend family and D. A. Callaway for providing their first stage and wonderful fans to play for at the Bluegrass and BBQ Festival. The heart and driving force of the festival is D. A. Callaway who encouraged the family from the very beginning giving them the Medicine Wagon stage for performances in 2007. Mr. Callaway has encouraged many families with his kind words and respectful treatment for bands at all levels of ability. He has connected the bluegrass community in many wonderful ways by providing venues and making introductions. His particular heart for young musicians and families playing bluegrass music together along with Silver Dollar City’s outstanding stages and patrons continue to inspire new musicians and promote established bands. The Petersens’ opportunities to perform at the park allow them opportunities to grow as a band, gain new fans and play alongside the world’s best musicians. The Petersens will be performing at the Bluegrass and BBQ festival this year on May 10th and 11th at the Dockside theatre. They will perform four shows per day at the following times: 11:15 AM, 1:30 PM, 3:45 PM and 5:00 PM. If you are unable to catch The Petersens at Silver Dollar City, you can find them all year at the Branson IMAX Entertainment Complex. Their show is currently rated #2 on TripAdvisor out of 153 shows and attractions in Branson. They perform their Bluegrass and Gospel show on Tuesdays and Thursdays at 2:00 PM and their all new Gospel show on Sundays at 2:00 PM. You can find their 2018 show schedule here.